A war hero is exiled by his people compelling him to ally himself with his sworn enemy to exact revenge in Ralph Fiennes’ directorial debut of William Shakespeare’s Coriolanus. This modern day retelling is a spellbinding story of action, betrayal and political intrigue starring Fiennes, Vanessa Redgrave, Brian Cox, Jessica Chastain and Gerard Butler. Ralph Fiennes makes his directorial debut with the Shakespearean tragedy Coriolanus which is reconfigured as a bloody, violent take on modern warfare. Reprising a role he played on stage over a decade ago, Fiennes stars as the imposing Roman general Caius Martius Coriolanus alongside acting heavyweights Vanessa Redgrave and Brian Cox, Gerard Butler and Jessica Chastain. A challenging story to bring to the screen in terms of characters and plot, Coriolanus takes Shakespeare’s dialogue and sets it in contemporary Rome amid clan rivalry and civil unrest where brutal battles are commonplace. 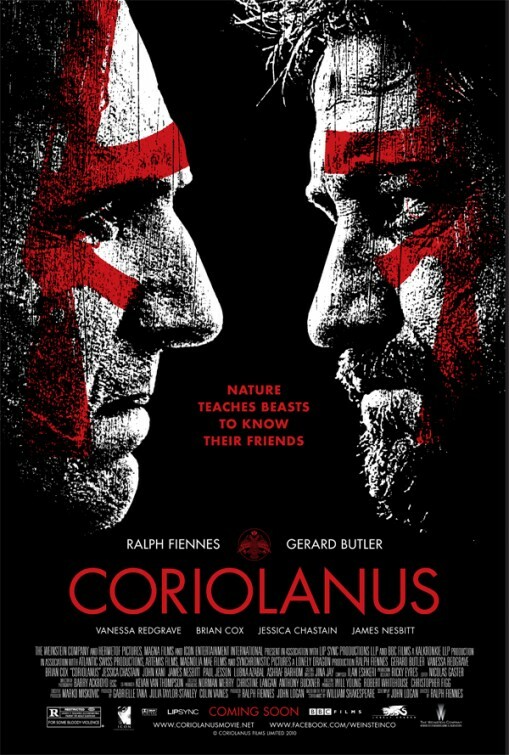 Fiennes’ Coriolanus is a headstrong, stubborn, war machine of a general who is uncompromising in his battle against the Volscian army led by Aufidius (Gerard Butler). After a spectacularly successful battle, Coriolanus is encouraged to run for consul- the highest elected office of the Roman Republic. When his efforts are undermined by scheming members of the Roman Senate, the Roman citizens reject Coriolanus as the decorated general they had previously worshipped, and banish him from Rome. On a crusade for vengeance against the city he had so fiercely defended, he embraces the Aufidius and Volscian army to plot a terrifying assault on the city of Rome. …The cleanly-shaven, bald general smeared with the blood and debris of battle is a sight to behold. At once menacing and powerful, Coriolanus is also a bit of a momma’s boy, seeking guidance from his steely mother Volumina (Vanessa Redgrave)… Redgrave is phenomenal in a role that seems to be custom-made for her. She expertly and effortless guides her character through a range of emotions in a wholly moving performance. Gerard Butler is efficient enough in his role, though he never seems to match the fire and conviction of his co-stars, like Brian Cox as the weary diplomat who paints himself as a negotiator and confidant. Print courtesy of THE WEINSTEIN COMPANY.